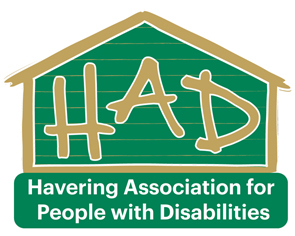 H.A.D’s Community Friends Project is modeled on our previous befriending project and aims to improve social inclusion for disabled adults. Our friendly Community Friend volunteers will provide companionship over the phone or face to face with the aims contact and provide information. 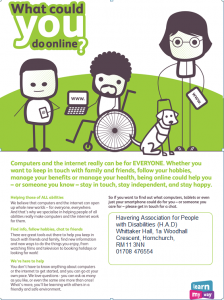 If you can spare a couple of hours weekly or monthly, to chat or enjoy a pastime, you could make a huge difference in the life of someone with a disability improving their social inclusion. H.A.D provides volunteers with training, a DBS (where appropriate), out of pocket expenses and a high level of support every step of the way. Further training and regular ‘Time to Talk’ sessions are provided to enable volunteers to feel confident in their role and valued as an important part of H.A.D. Volunteering is a very rewarding experience for all involved. Please see our role description for further information on volunteering as a Community Friend. Come along to our weekly Friendly Friday Social Group where you can make new friends, use our computer suite, including our Kindles or the drawing and colouring tablet, catch up on social media or join the activities in the main hall to play our Wii, board games/card games, puzzles and more! Enjoy a cup of tea or coffee, cakes and companionship. 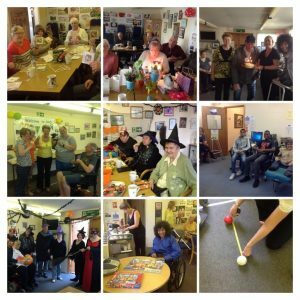 We hold different themed social events throughout the year with organised lunches varying from soup/hot rolls, pizzas, pie & mash, fish & chips (to be paid by individuals) Extra activities have included craft sessions & boccia. All welcome. Find out what surfing the net is all about and how to stay in touch with friends anywhere in the world by E-mail. Work at your own pace, one-to-one with a volunteer tutor. (booking essential). H.A.D are also an Online Centre and have access to a number of online training programmes. Please contact H.A.D on 01708 476554 for further information.